No machines found here! 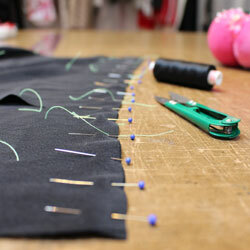 This course will explore the world of couture sewing by constructing a garment fully with hand sewn techniques. 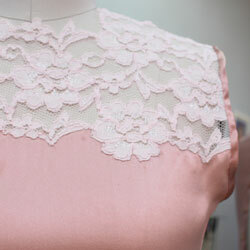 You will develop an appreciation for quality constructed garments. Notes are provided by studio. Studio is fully equipped with equipment and supplies. Student material list will be available at time of registration. Students will use a commercial pattern with focus on hard to handle fabrics such as silk, organza, chiffon, satin, lace, velvet, etc. Basic hand stitches, thread markings, darts, pressing, seams, hems, seam finishes, fastenings, decorative details, button holes, lace work and more. Please note techniques for each student will vary depending on pattern choice. There are no set dates and times for this course. Students need to book above required hours in the studio. A great way to book this course are 8, two hour long lessons once per week. Hourly instructional rates found HERE.